The best quality leather chalk holders in the World. All products are hand made from the finest materials in the world. Imported Italian leather that is used to make professional show saddles. Water proof and stretch resistant. No glue or plastic, nothing but "Pure Excellence". This stylish European "redesign" of the classic chalk holder - with a twist - has brought new meaning to "Class Act". They are made from the same leather used to make Fine European Show Saddles and will hold their shape. Exclusively on the "Euro" Pocket Chalker is the "Snap Strap Cover" to keep the dust out of your case, hold the chalk in and allow you to use ALL of the chalk. 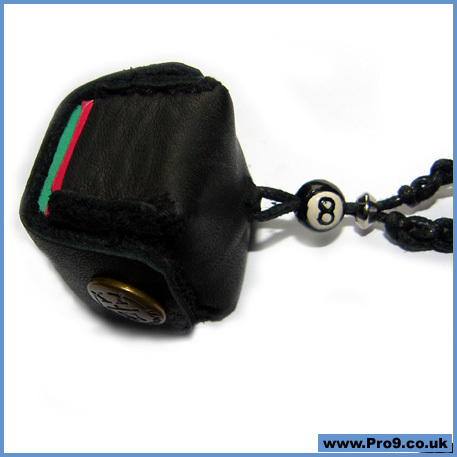 Made with a hand-painted Peruvian ceramic 8ball or 9ball, accented in white metal and "tied together" with waxed nylon cord make this a chalk holder a "Player for Life". Lifetime Guaranteed.